UNC Charlotte economist John Connaughton presented his economic forecast on Thursday, March 2, 2017. An economic sector analysis revealed that thirteen of the state’s fifteen economic sectors are forecasted to have output increases in 2016. Construction is forecasted to have a 5.7% real increase. 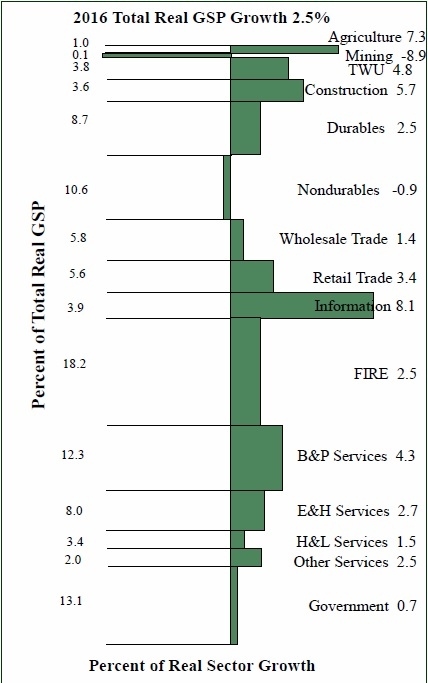 The graph below, courtesy of UNC Charlotte, shows the 2016 total real GSP growth of each sector, and the percent of total real GSP from each sector. “Positive economic growth in 2017 would represent the eighth consecutive year of economic growth for the North Carolina economy. While this is an impressive string of growth, the size of that economic growth has been somewhat lacking. In fact, for most of the 21st Century, both the U.S. and North Carolina economies have been unable to achieve an average 3.0 percent real GDP growth rate that had been fairly consistent since WWII,” Connaughton said. Click here to view the March 2017 Forecast Report (PDF).